In 1996 Goem was the first foreign act signed to Raster Noton, to release a long forgotten classic ‘Stud Stim’ on CD. The three members of Goem got acquinted with the three members of Raster, Alva Noto, Bytone and Komet. When some money rolled in from Goem concerts, they decided to invest that in a new label adventure called Audio.NL. 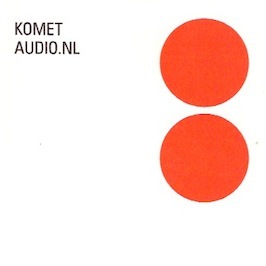 They returned the favor by releasing two 12”s record by Komet, the monikker used by Frank Bretschneider. Two classic 12” record of great minimalist electronic dance music. Shortly after that Bretschneider decided to drop the Komet name and go by his own name from then on. Audio.NL stopped being a label more or less when Goem stopped being a trio. The two 12”s slipped out of sale and are now sought after. They are now remastered by Bretschneider, along with a track he submitted to a compilation 12” on Audio.NL (030) and gets a great CD re-issue. This CD comes in a plastic wallet with printed inserts.